Nearly 20 years removed from its original airdate, I’m not sure we can fully appreciate just how razor-sharp the satire in “The Joy Of Sect” really is. This episode aired less than a year after 39 members of the Heaven’s Gate cult killed themselves in order to reach a starship hidden behind the Hale-Bopp comet. In the episode’s DVD commentary, writer Steve O’Donnell notes the production team took care to tone down and change some of the eerier similarities between the Heaven’s Gate story and the original draft of the episode, which returning showrunner David Mirkin had started working on shortly before the mass suicide occurred. Even so, the episode’s Movementarians promise a new and better life awaits Springfield when their spaceship transports them to the planet Blisstonia. I’m sure Mirkin and company changed enough details to take the episode out of the realm of tastelessness, but it’s not as though anyone familiar with the Heaven’s Gate story—which I imagine was still a decent chunk of the population in February 1998—was going to miss the similarities. What might well have flown over people’s heads in 1998 but is so obvious now is which cult is the real primary target of the episode’s satirical ire, and it’s the granddaddy of them all: the Church of Scientology. In a world where South Park made “Trapped In The Closet,” where Paul Thomas Anderson got The Master made, and where Going Clear is only one of a seemingly endless succession of Scientology exposés, it’s easy to take for granted that the once closely guarded secrets of the group are now common knowledge. Admittedly, I was still just a teenager when this episode first aired, so I wasn’t the most informed possible viewer, but I know I took the talk of billion-year contracts and ferociously zealous legal teams as just general anti-cult gags as opposed to pointed jabs at Scientology. Hell, it was only while researching “The Joy Of Sect” for this review that I learned the Leader’s appearance was specifically based on L. Ron Hubbard, which, damn. This is one seriously fearless episode. But audacity is only one of this episode’s virtues, as it also proves its brilliance in how it explores the mechanics of indoctrination. Just about every book that uses The Simpsons to explore psychology, religion, or philosophy gets a ton of mileage out of “The Joy Of Sect,” and it’s easy to see why. The orientation film scene strikes the perfect balance between comedy and commentary, as the Movementarians use an obvious yet staggeringly effective intimidation tactic to keep the skeptical from leaving. The cult uses the language of politeness, stressing that Carl is free to leave and only requesting he explain why he wants to go, yet they do so to force him to make a very public statement of defiance in a very harsh spotlight. Faced with such pressure, most would opt to go with the flow. 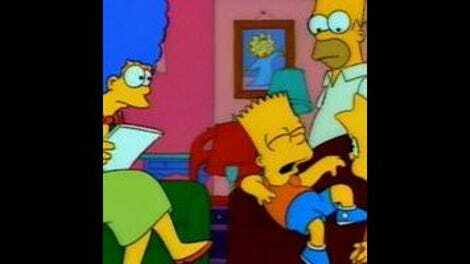 The point is clear enough the first time that The Simpsons can then have fun with its repetition. It serves the satire to use a relatively intelligent, everyman character like Carl to underline the point that anyone could be susceptible to these tactics, and that then frees up the show to use a doofus like Otto for a more jokey second beat. By then, the episode has already reduced its satire to shorthand, with Manjula, Lionel Hutz, and some random dude sitting back down the moment the spotlight comes on. It’s a crisp bit of comedic pacing that helps the scene avoid feeling heavy-handed, and Homer’s bit about internal affairs is the perfect absurdist button to the scene. The thing I keep coming back to as this episode’s most trenchant observation is the fact that brainwashing really has little to do with preying on the dumb or the gullible. Cult members aren’t idiots. Rather, they’re people like you or me to whom very clever, very manipulative assholes said precisely the right things at precisely the right moments to puncture their defenses and turn their worldview on its head. “The Joy Of Sect” best illustrates this with how it treats Homer and Lisa. The episode is more explicit in how it subverts audience expectations with Homer, setting him up as the highly suggestible type and then revealing he’s the last of the session attendees to break, albeit for the very dumbest of Batman-related reasons. Lisa, by contrast, is the likeliest character to bring down the Movementarians—as previous episodes have made clear, she’s both an iconoclast and a skeptic—yet the prospect of getting a bad grade, even in a Leader-obsessed curriculum, is enough to win her over. Lisa finds the whole cult thing utterly ridiculous and disgusting, right up to the moment they offer her the peace of mind she so desperately craves. In that sense, Marge is the ideal character to rebel against the Movementarians. She’s the least ambitious of the Simpsons, which is one of a few reasons the writers always struggled to build compelling episodes around her. She just doesn’t want things as badly as Homer or Lisa or even Bart does. Looking at that as a positive instead of a negative trait, as the presence of something rather than the absence, we can say Marge is the character who understands herself best. Some of that probably has to do with her faith, which is particularly relevant here, but it’s more universal than that. On a really basic level, Marge doesn’t need external validation in the way the other Simpsons do, and that gives her the strength of character to escape the Movementarians, even when it involves evading a Prisoner-inspired gantlet. Marge is very much the exception, though, and this is why the residents of Springfield are such ideal targets for the Movementarians. While this is usually played for laughs, a crucial trait of the townspeople is how empty their lives are and how close most of them are to utter despair. The audience doesn’t have to actually feel that anguish for it to work as the foundation of jokes. Willie’s sudden conversion is funny because it happens so ridiculously quickly and because it’s such a complete reversal of the setup of the scene. But the reason why it resonates, why Willie’s instant love of the leader is something more than just a tossed-off gag, is because we know enough about Willie to believe that his life really is that sad and his psyche really is that fragile. The closing gag, in which the Simpsons shift their blind devotion from the Movementarians back to Fox (and, um, Moe shifts his back to good old-fashioned voodoo) works nicely as the kind of irreverent cheap shot at the show’s corporate masters that The Simpsons has always enjoyed—and David Mirkin especially loves doing, if his DVD commentaries are anything to go by—but it’s also an extension of how the show has depicted its ensemble from the very beginning. There’s one big criticism to level against this episode, and it’s one that’s oddly in keeping with the depiction of how cults dehumanize their members. While the satire makes good use of the townspeople relative to what we normally see of them, that focus on larger commentary does mean the characterization of the Simpsons themselves is more threadbare than usual. The episode zips along so quickly that it’s easy to miss this, but the Movementarians’ prohibition of beer is only actually mentioned once before it’s brought back as the reason Homer snaps out of his brainwashing, and the rationales behind both Homer and Lisa’s total acceptance of the Leader feel kind of flimsy if you stop and think about them. Again, they work fine in context, but they feel a tad underwhelming. Some of that is down to the presentation: Bart’s conversion is the most tossed off of the bunch, but that works perfectly because it’s so fast. 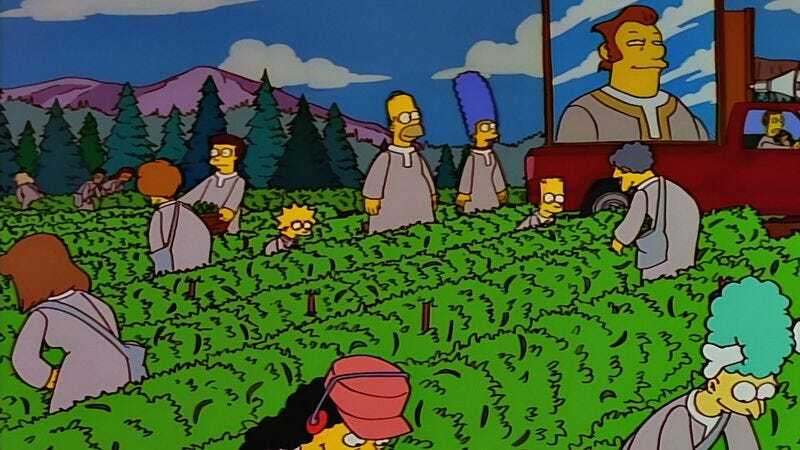 What “The Joy Of Sect” does with Homer and Lisa works brilliantly as satire, so it’s not such a big deal that their conversions end up feeling more like plot points than character beats. It’s just that, well, there is this feeling that The Simpsons of a season or three ago might have been able to inflect those story beats with a little more depth of character, or cranked up the John Swartzwelder-style absurdity that extra notch. I wouldn’t even go this far if not for the fact that the episode devotes a full two minutes—nearly a tenth of the episode!—to an extended, very ramshackle digression in which Mr. Burns and Smithers launch their own rival religion. Some of the gags here are such gloriously stupid throwaways that they were obviously just included to make cutting the episode down for syndication that much easier. The whole business with Mr. Burns drawing corporate logos and Lenny loving Special K is just deliriously pointless, which I do kind of love, but that minute of screentime could well have been devoted to sharpening the characterization in the actual story. That’s as good a way as any to delineate just why this episode represents The Simpsons at the beginning of the downslope from its creative peak. “The Joy Of Sect” is a terrific, terrific episode, one of the show’s most cutting satirical entries and one of the best uses of the townspeople as a whole. The places where it errs aren’t exactly minor missteps, but they are also well hidden, the kind of flaws that are easily missed because the episode’s strengths are more than enough to divert the audience’s attention elsewhere. This is a definite contender for the ninth season’s most ambitious episode, at least in storytelling terms, and the fact that The Simpsons is almost entirely up to the task it sets itself is very much to the show’s credit. Another non sequitur sequence is all the opening business at the airport, though by the standard of irrelevant Simpsons opening sequences that precede the actual episode plot, this episode gets through that material quickly. What’s unusual about it, if anything, is how scattershot the jokes are, with everything from random jabs at Robert Ludlum to Faberge egg gags. You kind of feel like David Mirkin was just squeezing in every random joke he had built up since he stepped aside as showrunner at the end of season six. Speaking of which, this is one of two ninth season episodes that David Mirkin ran, along with the clip show “All Singing, All Dancing,” which we didn’t actually cover in that space because, well … what more do you need than the Paint Your Wagon bit? It’s really all you need to know. I would really love to see this episode retold from Lenny’s perspective. I can’t believe he was strong-willed enough to abandon Carl to a cult like that!